As construction’s labor shortage persists, it may finally be time for home builders to embrace offsite fabrication. Since early 2016, Zarrilli Homes’ phones haven’t stopped ringing. “Business has been great,” says owner Anthony Zarrilli about his 13-year-old modular home building company in Brick, N.J., which was on pace to complete 36 homes in 2017. Martinsburg, W.V.-based Express Modular, which markets its homes and construction services exclusively over the internet and has built in 41 states, expected to complete more than 50 modular houses in 2017. President Ken Semler says his company gets more requests for work than it can handle. And Champion Home Builders, which ships around 1,700 modular homes annually from 22 of its 28 factories, is in expansion mode. In 2016, it acquired Excel Homes, including five plants. Champion is also one of the manufacturers (Idaho-based Guerdon Modular Buildings is another) that supplies modules to hospitality giant Marriott International, which in 2017 expected to sign 50 hotel deals whose construction incorporates preassembled guest rooms or bathrooms. Clearly, demand for residential modular and prefab construction is increasing. 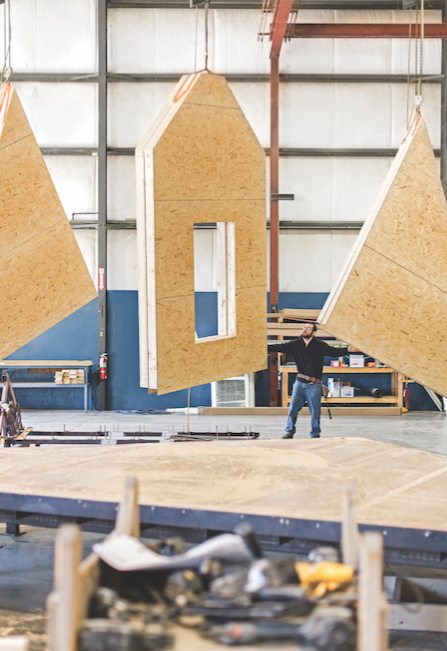 More stick builders, frustrated by their inability to find skilled labor, are dipping their toes into modular’s stream, with codes and regulations that limit modular and prefab construction showing signs of receding. Finish Werks, a Savage, Md.-based builder, completes eight to 10 modular homes per year, ranging from 1,100 to 9,000 square feet, and from $350,000 to $900,000 (excluding the cost of land). Its big push is on quality and energy efficiency. “Better performance equals better marketing,” explains owner Harris Woodward. Set day for a house by Finish Werks, a modular builder based in Savage, Md., that constructs about 10 homes per year. 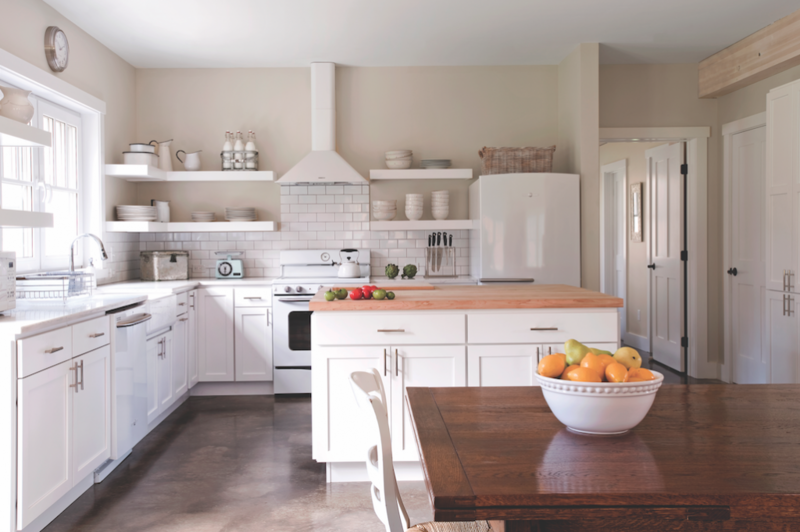 The builder’s big push is on energy efficiency (Photo: Courtesy Finish Werks). Gable walls on a hoist at a Champion Homes factory. The company ships around 1,700 modular homes per year from 22 of its 28 facilities (Photo: Courtesy Champion Homes). The sales pitch is simple: With money cheaper to borrow these days, Woodward asks buyers to give him $10,000 to make their home’s envelope more efficient. “That works out to $55 more per month on their mortgages, but will translate into $150 monthly in savings on their utility bills,” he says. Woodward speculates that it’s only a matter of time before “somebody big” enters modular production as a game changer, as Elon Musk is trying to do with solar-powered batteries. Bob Bender, COO of Commodore Corp., the Goshen, Ind.-based supplier of HUD-code and modular houses, says that Commodore produces modular homes from six of its plants and works with a network of 500-plus builders and retailers in more than 30 states. Commodore ships an estimated 1,500 modular homes per year. Over the past four years, it has “dramatically expanded” two plants, and has acquired two others, to keep up with demand, Bender says. “There’s a phenomenal opportunity for modular to grow in the U.S.,” says Kristopher Megna, who in 2009 started Dreamline Modular Homes, in Lexington, Mass. His company expected to complete 35 modular houses in Massachusetts and Rhode Island in 2017, a 35 percent increase over 2016. 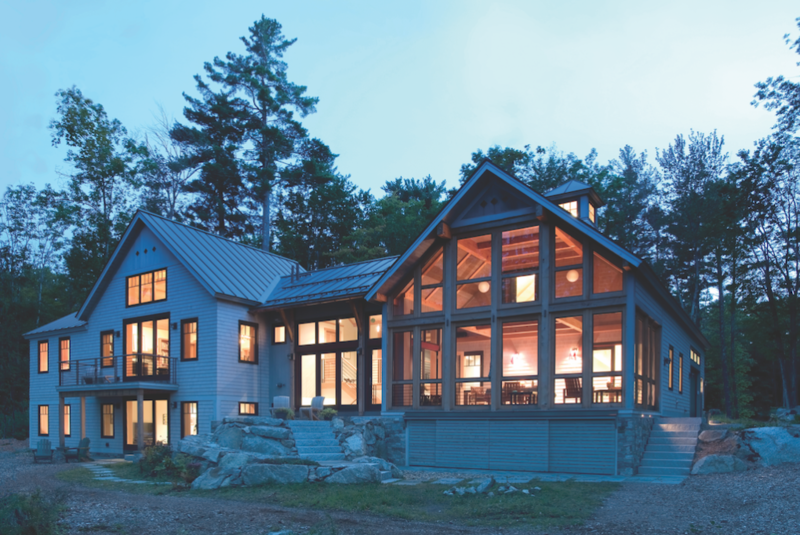 Fabricated by Bensonwood, this 3,063-square-foot custom home in New Hampshire includes a high-performance building shell, low-E windows, radiant-heat flooring, a heat recovery ventilation system, LED lighting, and many locally sourced materials (Photo: James R. Salomon Photography). But wait a minute, say some industry watchers: Haven’t we heard all this before, only to watch modular slump back into its tiny corner of the housing market? Skeptics will point out that labor shortages also affect modular production and construction. The industry’s current production capacity couldn’t handle a significant surge in demand, and most manufacturers are not disposed to invest in new plants. And modular still suffers from an identity crisis with homebuyers who can’t or won’t distinguish modular houses that are as stylish and sturdy as anything that’s stick-built from the container-like double-wides that populate mobile-home parks. Fred Hallahan, a modular expert and consultant who is president of Hallahan Associates, in Baltimore, says multifamily and commercial sectors are imperative for modular builders and factories to survive. He points out that it’s a “tough sell” for a single-family modular rancher to compete on price with a HUD-code or stick-built house in rural America. 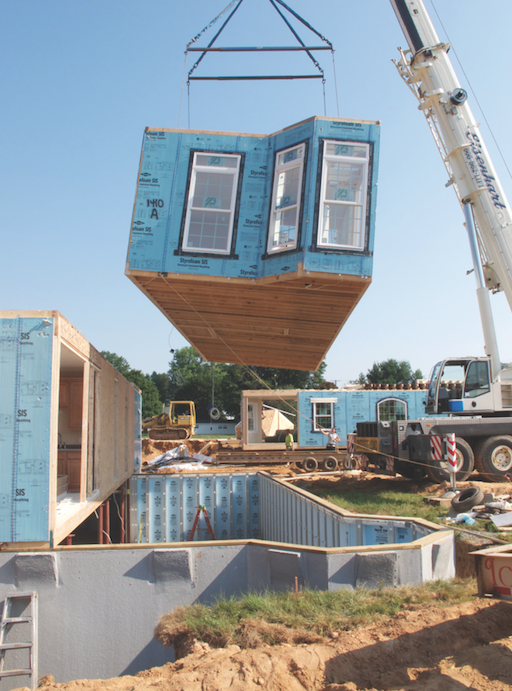 There’s money to be made from modular construction, concurs Robert Dietz, chief economist for the NAHB, whose Building Systems Council includes modular and prefab builders. “But how you do it, and where, are the questions.” Answers to those questions lie in where the modular industry is right now. There are about 80 manufacturers of HUD-code, modular, and prefab houses and components operating more than 200 factories in the U.S. While factory-built modules are being set and completed within subdivisions, it’s still very much a scattered-lot business and highly fragmented among hundreds of mostly small builders. “It’s more like a bunch of factories making the same thing than it is an industry,” quips Semler of Express Modular, whose company works with more than 20 manufacturers and a network of general contractors. But modular manufacturing is humming. In 2017, for the first time in five years, modular-home shipments approached 15,000, or 8 percent more than in 2016, according to estimates by Hallahan Associates, which collects shipment data for the National Modular Housing Council (NMHC). What surprised Fred Hallahan was the activity in the Midwest and West, where demand for modular homes has historically been weak. Multifamily construction drove a 17 percent increase in modular shipments in the Midwest and a 13 percent gain in the West, he says. This energy-wise home in New Jersey, from Unity Homes’ Tradd platform, is 3,418 square feet. Unity ships throughout the Northeast from its New Hampshire plant and eventually plans to bring production to the Northwest, Mid-Atlantic, and Colorado (Photo: Virginia Hamrick Photography). The Mid-Atlantic and South Atlantic still account for the greatest demand for modular homes. Hallahan’s numbers show that demand in the normally strong Northeast fell off last year, but he’s quick to note that this region’s future pipeline looks promising. Dietz, though, remains skeptical that modular or prefab construction can make a much bigger splash, especially given Census Bureau estimates that show modular hovering between 2 percent and 4 percent of annual housing starts from 1992 through 2016. So why the optimism among builders and suppliers, when arguments in favor of modular and prefab construction haven’t inspired buyers? It’s the housing industry’s ongoing shortage of skilled labor. While employment of residential building and specialty trade contractors has risen, finding enough subs and laborers to meet production goals at wages a builder is willing to pay is a pressing issue. It’s prompting a rethinking of how to complete enough homes to meet sales objectives. For some, factory-built modules have become a starting point. “Can you imagine what going from 13,000 to 36,000 homes would mean to this industry?” Zarrilli asks. But modular construction also depends on skilled labor, in the factories and in the field. Gary Fleisher, who writes the blog Modularhomecoach.com, recounts a visit last summer to a factory that had been producing between 12 and 15 modules per week. It had cut back to seven per week because “it doesn’t have enough people.” Fleisher notes that turnover at some factories is as high as 160 percent. Megna of Dreamline Modular Homes says the houses his suppliers (predominantly Excel) deliver to jobsites are typically 60 percent complete. Based on buyer demand, his company could be doing more than double the number of houses it currently builds, “but not all of them turnkey,” he cautions, because it couldn’t find the skilled labor for that much work. 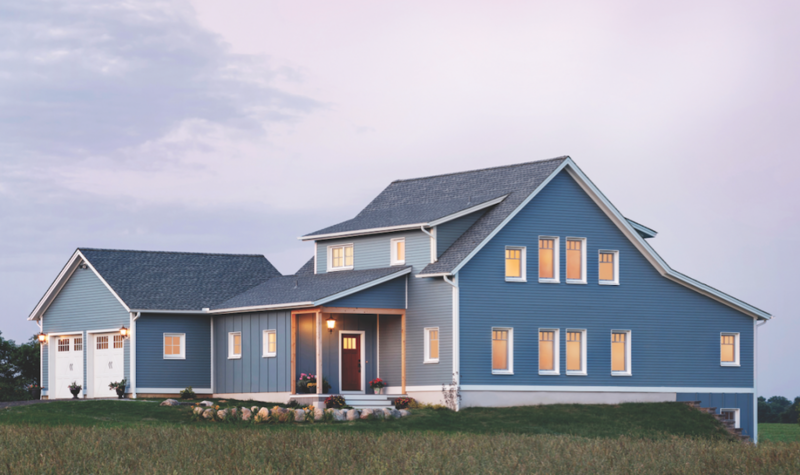 Jerry Folger, sales and marketing manager for Stratford Homes’ 44,000-square-foot factory in Rathdrum, Idaho, says his plant’s builder base has shrunk by 50 percent, to only around 20, since the recession. Travis Willman, director of sales and marketing at the company’s 110,000-square-foot plant in Stratford, Wis., adds that “labor is the No. 1 concern” among the 50 to 60 builders that his plant works with. Several industry insiders say that automation will be the next step in modular and prefab production. “I don’t know how we solve the labor shortage otherwise,” consultant John Burns told Bloomberg News. Some modular manufacturers in Europe and Asia—such as Sweden-based Lindbäcks, whose 194,000-square-foot automated factory delivers more than 20 apartments per week, and Toyota, which is a leading modular home supplier in Japan—have successfully integrated automation into their production processes. For 43 years, Bensonwood has made high-performance timber-frame components for high-end homes. In 2012, it spun off a subsidiary, Unity Homes, to provide more affordable high-performance houses using the same wall, roof, and floor components that had been developed by Bensonwood. The supplier’s two plants in Walpole and Alstead, N.H., make components for 50 and 70 Bensonwood homes per year; Unity produces components for about 30 homes per year. In November, Bensonwood and Unity began producing panels in a new 104,000-square-foot factory in Keene, N.H., which will increase the company’s production capacity fourfold. But is automation sophisticated enough to provide the kind of customization that homebuyers demand? Los Angeles-based mnmMod operates a 10,000-square-foot factory in Vernon, Calif., that prefabricates steel-framed extruded polystyrene wall panels that are completely customizable, says Tryggvi Thorsteinsson, who founded the company in 2007 with his partner Erla Dögg Ingjaldsdóttir. MnmMod has its own designers and also works with outside architects. Production capacity is one of modular’s speed bumps, as is finding suitable lots. Zarrilli says he fills out far more paperwork for modular construction than for stick-built, with two employees who do nothing but handle permits. at night; in Chicago, construction unions prevail. Despite these obstacles, resilient modular advocates see their industry gaining traction. Just about everyone agrees, though, that the industry’s greatest challenge remains educating consumers about the benefits of modular houses. Clayton Homes’ website includes information about its building process and commitment to quality and durability. Clayton and another large supplier, Ritz-Craft, feature an array of images that showcases their products’ designs, styles, and materials. The Modular Home Builders Assocation recently launched a consumer awareness campaign to explain the differences between modular and manufactured housing, and to get modular onto more homebuyers’ radar screens. But changing buyers’ minds will take patience and perseverance. A longer-term strategy may be what’s needed to influence Millennials, many of whom have so far been indifferent about purchasing any house. “We believe the next generation of homebuyers will have less of a perception issue about homes built indoors,” predicts Commodore’s Bender, fingers crossed. CenterStack at Austin Convention Center, by Kasita, which makes small, affordable, stackable modules from its plant in Austin, Texas​​​​​​. 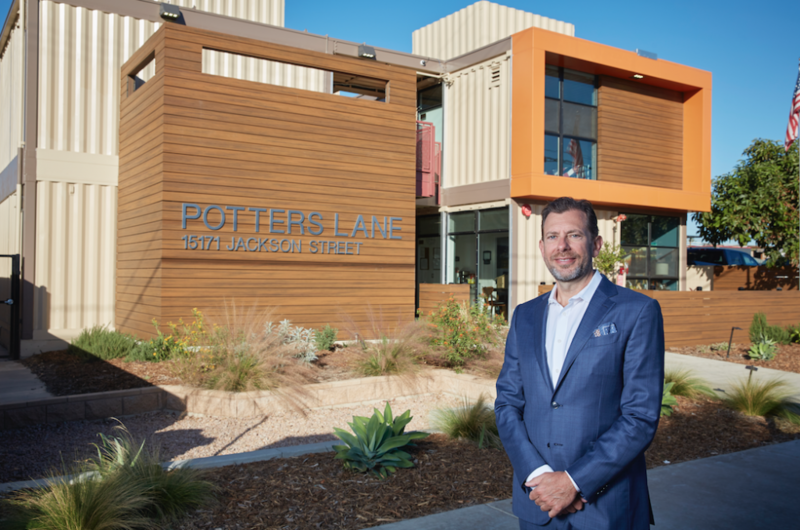 “Our real target is multifamily urban density,” says Martyn Hoffman, COO (Photo: Courtesy Kasita). Multifamily housing seems more and more like a good fit for modular and prefab construction. And his business continues to grow: this year Buckley launched a company that sets modules on jobsites, and another that assembles and sets roof components. As his company expands, multifamily construction has accounted for the vast majority of its work. “That doesn’t mean the demand for single family has gone down; it’s just that demand for multifamily has grown,” says Buckley. While most modular and prefab factories continue to serve single-family builders, they also see multifamily as an expanding target. For example, since 2009, Maine-based GoLogic has built about 75 homes with components its factory prefabricates that can meet LEED and Passiv House standards. Half of those homes are multifamily units within the Belfast (Maine) Ecovillage, says partner Alan Gibson. “Our goal is to maintain our current market share in single family, and to grow in multifamily and hospitality,” says Steve Payne, Director of Business Development-U.S. Operations for Champion Home Builders in North Carolina. Champion is supplying product to Marriott International. Its factory in Liverpool, Pa., made the guestrooms and bathrooms for the four-story 123-room AC Hotel by Marriott in Chapel Hill, N.C., which opened last September. A second Marriott hotel built with Champion-supplied modules is in Louisville, Ky. Most modular startup suppliers are multifamily-centric, too. 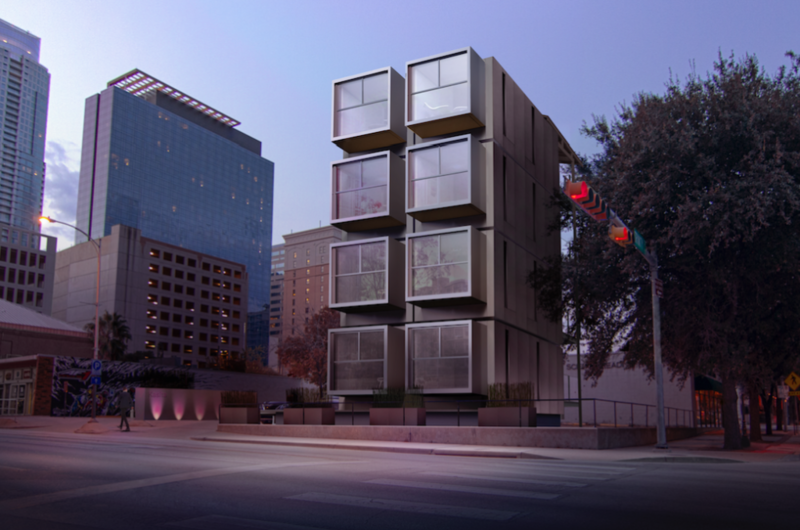 “Our real target is multifamily urban density,” says Martyn Hoffman, COO of Kasita, which makes small, affordable, stackable modules from its plant in Austin, Texas. Google bought 300 units of modular housing for employees who will work at its planned Bay View campus in Mountain View, Calif. That contract, estimated at $25 million to $30 million, is the first order for Factory_OS, a San Francisco-based startup dedicated to the multifamily sector. Its founder and CEO is Rick Holliday, a local developer who co-founded BRIDGE Housing, which develops affordable housing and has been involved in several multifamily modular projects. •GrowthPoint Structures, Santa Monica, Calif., operates a 140,000-sf factory in Carson City, with four production lines. Since 2014, GrowthPoint has completed the design, production, and installation of six projects, collectively over 200,000 square feet of habitable space, using modules fabricated from approximately 500 shipping containers. GrowthPoint designs buildings to withstand natural disasters. Most of the modules it supplies are currently being used to build multifamily projects that include the recently completed Potters Lane, a 16-unit affordable housing project for veterans in Midway, Calif. GrowthPoint’s order mix for the next three years is 75% residential and 25% schools. •Blokable, founded by Aaron Holm, helped Amazon develop its bricks-and-mortar bookstores. Blokable expects its plant in Vancouver, Wash., to be producing 20 “bloks” (18- to 38-foot-long customizable modules) per month by early 2018. 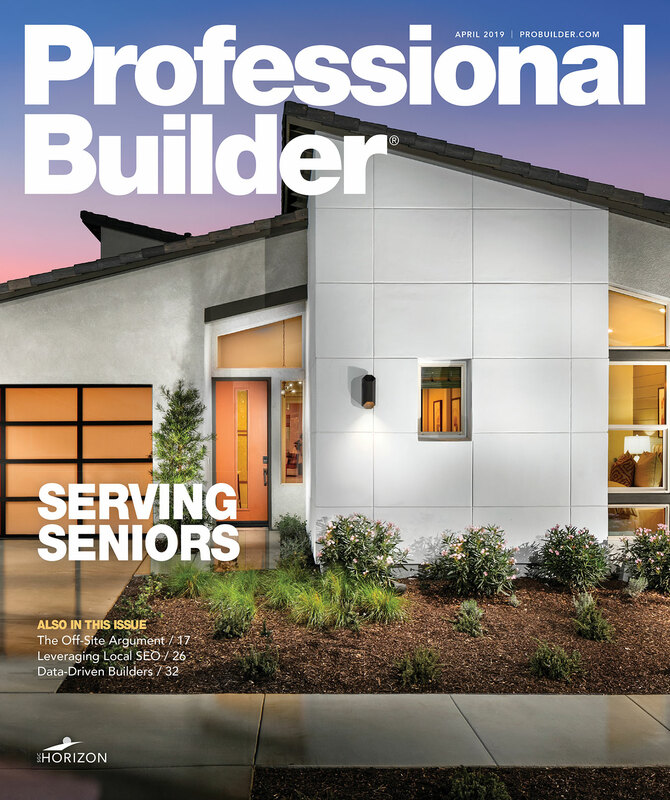 •Nemo Building Systems, Lathrop, Calif., is part of Nautilus Group, a fully integrated real estate investment, development, and design-build construction group. Nemo distributes in California. •FullStack Modular, Brooklyn, N.Y., in the fall of 2016 acquired the assets of Forest City Ratner’s FC Modular division, including its 100,000-sf factory in Brooklyn’s Navy Yard. Among the recent projects it has supplied is 461 Dean, a 32-story, 363-unit residential high rise in Brooklyn, which Turner Construction built and opened in November 2016. FullStack Modular confirms it will expand its distribution to the West Coast in 2018. A small but growing number of developers are considering building taller using factory-made mass-timber components. Last June, Oregon’s Building Codes Division approved the construction permit for Framework, a 12-story, 148-foot-tall mixed-used building with 60 apartments, which will be the nation’s first high rise made from wood (actually cross-laminated timber (CLT), glulam beams and columns, supported by a reinforced concrete foundation). In November, the Portland Housing Bureau, through its Fast Starts program, awarded the Framework Project $6 million to continue its development. Framework’s technology is being paid for by grants from the U.S. Forest Service, Metro, Hewlett Foundation, Harbourton Foundation, Edwards Mother Earth Foundation, and the Oregon Community Foundation. Also completed last summer in Vancouver, British Columbia, was Brock Commons, an 18-story, $40 million residence hall for 404 University of British Columbia students. This is the tallest wood building in North America, made from CLT panels, glulam beams, steel connectors, and concrete. Several other tall mass timber projects in Canada and the U.S. are under construction or are in design stages.